Driver trainer and mentor Tony Finneran has published a book brimming with historical bus photos spanning almost seven decades. But there was more than a nostalgic admiration for the styles of old behind the creation of this book entitled ‘Gone but not forgotten – the lost liveries of Sydney’s route buses’. Gracing the front cover is the first bus Finneran ever sold – the Scania K93, model 236 – which was purchased by Punchbowl Bus and Coach Company in 1990. More than 170 different bus companies, 173 chassis makes and models and 54 bodybuilders feature in the book. Finneran started his career with Saab -Scania in 1987, but has had a passion for the industry for a long as he can remember. "If you look at some of the old styles, the bright glossy reds, they really were wonderful and had so much character," he says. "I have always had an appreciation for different styles of buses, from the late 1940’s right through to the current models." At 55 years of age, life was good for Finneran, but when tragedy struck, it took all his strength to regain even the semblance of a semi-normal life. "I had a strokeon Easter Sunday, 2013," Finneran says. "I was not well, at my lowest point I was fully paralysed and in ‘lock-in’ syndrome. "It was hard on my familyand work colleagues in particular John Allen - with 2 L's, but they were there for me all the way. "One night in Bankstown Hospital I decided to compile a book featuring all my favourite old bus photos, which I would try and get published." 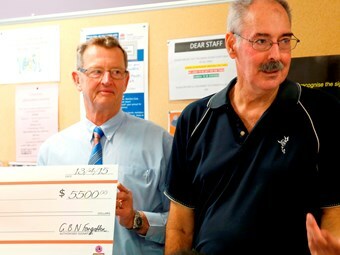 Surrounded by family and friends, his Scania workmates, New South Wales bus industry identities and hospital staff, they all celebrated his achievement together at the Bankstown-Lidcombe Hospital’s Stroke Rehabilitation Ward on April 13. "The book launch was fabulous, a pretty humbling experience" Finneran says. All 490 copies of the original print-run have sold out, and Finneran says he will wait for the re-sellers to exhaust their stocks before a second print-run is arranged,if required. "21 photos in the book were photographed by Ian Lynas and I appreciate his contribution. "I was not able to credit him in the book, because I didn’t find out [it was he who had taken them] until after it was published." $10 per book and a large donation by Scania Australia will go to the National Stroke Foundation, an organisation that holds a special place in Finneran’s heart – with $6000 donated already. National Stroke Foundation NSW executive officer Greg Cantwell expressed his gratitude to Finneran at the launch. "Tony has shown courage and determination in his recovery after his stroke," he says. "From being locked in his own body to now having written a book, he has inspired countless others through his journey."